The next team of Eco-warriors are up and running. 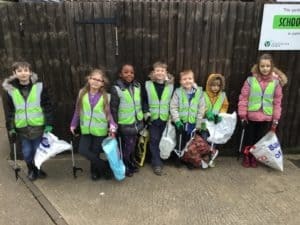 So far we have been really busy with lots of spring time jobs including litter picking and tidying up our garden shed. The Eco-warriors have recently designed their own Eco-warrior high vis vests and wear these each week whilst being busy outside doing our jobs. We are now getting ready to plant lots of fruits, vegetables and herbs now that the weather should be starting to warm up. We are also looking at how we can become much more eco-friendly at school. Some of our upcoming projects include looking at recycling more in school, learning about how we can re-use different things and developing our fruit and vegetable patch.